by N. Dresing et al. The solar energetic particle (SEP) event from 26 Dec 2013 was a so-called widespread event observed by multiple spacecraft. The two STEREO and one close to Earth spacecraft spanned a total longitudinal angle of 210 degrees at that time. Together with the 25 Feb 2014 (Lario et al., 2016, Klassen et al., 2016) this is the widest event ever observed with the STEREO spacecraft. Unusually long-lasting SEP anisotropies together with prolonged intensity rise times but short onset delays point to a spatial and temporal extended SEP acceleration and/or injection. While it is generally accepted that energetic protons can be accelerated by shocks, this is still debated for solar energetic electrons. We therefore analyze the multi-spacecraft remote-sensing and in-situ data to characterize the possible role of the shock for the electron event. The SEP event was accompanied by a complex solar event including an interaction of the associated coronal mass ejection (CME) with a pre-event CME. The interaction happened already within a height of about 4 solar radii and before the first SEPs were detected in-situ. The radio observations by STEREO B (Fig. 1 left) show two type II bursts indicating the presence of two distinct shocks likely associated to each of the two CMEs. Immediately after the disappearance of the second type-II burst at 03:12 UT, a broadband structure appears between 3:13 and 4:15 UT with clearly drifting high- and low-frequency cut-offs (indicated by white dashed lines). This whole structure, filled with type-III-like radio bursts, slowly drifts to lower frequencies with a drift rate comparable to the second type II burst. The drifting cutoffs are not harmonically related, suggesting that the low-frequency border could be a new propagating disturbance starting essentially higher in the corona than the second type II burst and its driver. This drifting type-II-like structure could be related to the interaction of the two associated CMEs. Furthermore, the type-III-like beams inside this drifting structure could be the signature of accelerated electrons between the two magnetic structures approaching each other. Figure 1. Left: Dynamic radio spectrum observed by STEREO B/SWAVES during 2:30-4:40 UT on 26 Dec 2013. Right: Longitudinal configuration of the Earth and the two STEREO spacecraft during the event. The gray shaded range marks a sector of 60 degrees well connected to the parent activity region at the Sun. Figure 1 (right) shows the longitudinal configuration of the three observing spacecraft during the event with STEREO A and B being separated by 59 degrees from each other and by 150 degrees to Earth, respectively. Figure 2 shows sectored near-relativistic electron measurements at STEREO A (left), STEREO B (center), and Wind (right). Although only STEREO A was magnetically well connected to the parent region of solar activity (marked by the gray sector in Fig. 1 (right)), significant and unusually long-lasting anisotropies (bottom panels of Fig. 2) were observed at all three spacecraft lasting up to a day at STEREO B. Figure 2. Top: Sectored energetic electron observations by STEREO A/SEPT (left), STEREO B/SEPT(center), and Wind/3DP (right). Bottom: First-order anisotropy. Another striking feature of the SEP event is the presence of a second and distinct high energy component which is detected four hours after the initial event onset. Fig. 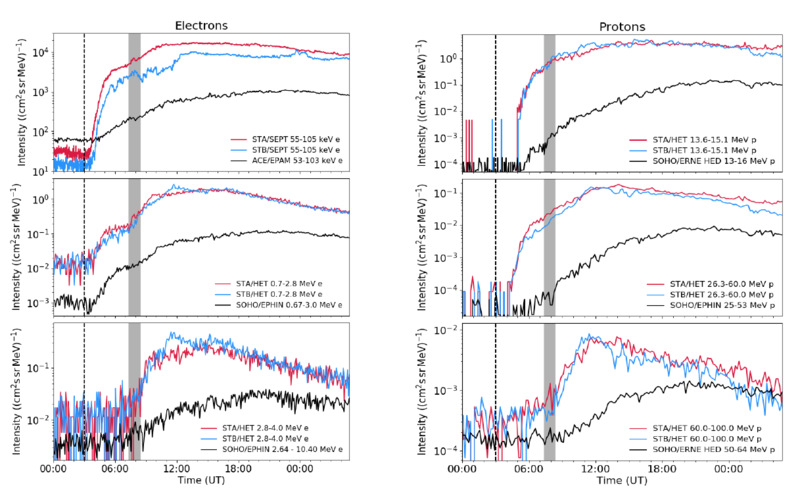 3 shows the SEP electrons (left) and protons (right) observed at the three different spacecraft with energies rising from top to bottom. Within the remarkably long-lasting rising phase of the overall event, the gray bar marks the approximate onset of the second component being more pronounced at higher energies (see middle panels) and even the only component which is observed at the highest energies (bottom panels). STEREO A (red) and STEREO B (blue) observe very similar intensity time series suggesting that they are equally well connected to the particle injection region. The similar but less intense time series at close to Earth spacecraft (black) and the short relative onset delays show that the two distinct SEP components are a global phenomenon likely distributed all around the Sun. Figure 3. Solar energetic electron (left) and proton observations (right) of the 26 Dec 2013 SEP event at the two STEREO spacecraft (red: STEREO A, blue: STEREO B) and close to Earth at SOHO or ACE (black) at comparable energy bins. Generally the energy increases from top to bottom. The long-lasting energetic electron anisotropies observed at all three widely separated spacecraft during the 26 Dec 2013 SEP event require a spatially and temporally extended particle injection which could be attributed to the shock(s) associated to the CME(s). However, the distinct later-arriving high energy SEP component cannot be explained by a simple shock-acceleration scenario. It rather requires a trapping scenario with ongoing particle acceleration to higher energies. The two interacting CMEs likely play a key role for this SEP event and possibly form this particle trap. The further acceleration of the trapped particles may therefore have been driven by the second shock passing through this structure. Alternatively, stochastic acceleration at the turbulence and/or at ongoing reconnection or simply the two converging CMEs may have been involved. This further acceleration is possibly reflected by the drifting type-II-like structure shown in Fig. 1. The second SEP component would then be caused by an opening of the particle trap which is likely triggered by a later activity observed on the other side of the Sun. Full list of authors: Dresing, N.; Gómez-Herrero, R.; Heber, B.; Klassen, A.; Temmer, M.; Veronig, A.